Popular holiday destination for families and couples. If there's anything more relaxing than strolling through the quaint Old Town of Alcudia before stopping for a refreshing glass of sangria in a local bar, we have yet to find it. You can bask in the glorious sunshine on your holiday to Alcudia, one of the most delightful resorts in northern Majorca, and get active with the whole range of exciting beach activities, so whether you're visiting as a couple, family or with friends you certainly won't be short for things to do! Embrace the gorgeous summer temperatures of up to 25°C, and head to one of the beautiful sandy beaches to top up your tan. Or, perhaps you're keen to have an active day at the beach - why not take advantage of the watersports, windsurfing or pedaloes? For a really unique experience on your Balearic Islands holiday, channel your inner explorer and go paragliding or snorkelling, or make a day of it and head to the harbour for an exciting boat trip. When you fancy a break from the beach, you can visit Alcudia's Old Town and admire the stunning architecture and the region's rich history. The stunning S'Albufera nature reserve is also less than half an hour away from Alcudia, if you fancy hiking and exploring the superb wildlife this serene reserve has to offer. For family-friendly fun, you'll be pleased to know that Hydro Park Alcudia is just over ten minutes away from the centre of the resort too. It's the only waterpark in the north of Majorca, and definitely worth visiting if you love water rides. You can also enjoy a spot of go-karting at Karting Magic and see who's the fastest in your family! The nightlife in Alcudia is laid-back in comparison to other Majorcan resorts like Palma and Palma Nova. However, if you're keen to show off your best dance moves, you can head to the port and revel in the bars and discos. Time to dine? You certainly won't go hungry on your holiday to Alcudia, with a wide range of restaurants serving traditional Majorcan food as well as Chinese, Indian, Italian, French and British cuisine. Head to the Old Town for a quiet evening of fine dining, or enjoy the freshly caught seafood or fish at the old fishing village of Porte d'Alcudia. If a holiday in Alcudia sounds like just what you're looking for, call Hays Travel today and trust us to book a exciting getaway to the Balearic Islands for you. We have over 37 years of experience in booking memorable holidays to Spain and the Canary Islands and we have been voted the UK’s Best High Street Travel Agent - so you can guarantee your well-deserved Alcudia holiday is in safe hands with us! 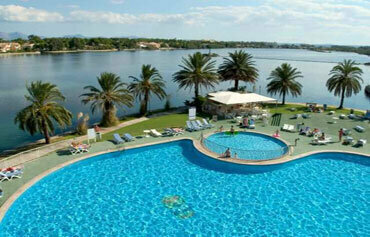 Esperanza Lake, on the outskirts of Alcudia, is the setting for the 3 star Bellevue Club. 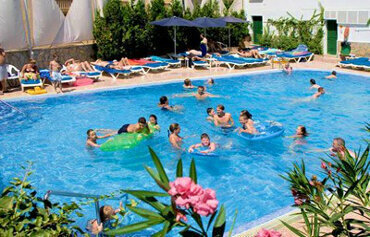 This large self contained resort is all about fun and lively family holidays in Majorca. There is a different pool for every day of the week, with no less than eight beauties to choose from. No need to wander too far from your sun bed for refreshments, with a pool bar close at hand. 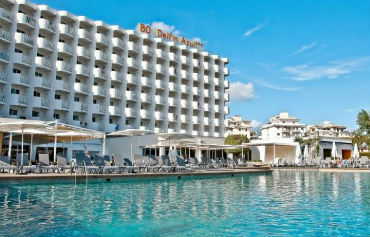 For family holidays and Majorcan sunshine, you can't miss the BQ Delfin Azul. Blending a relaxing vibe for adults with plenty to keep the children entertained, this Alcudia hotel goes all out to impress. 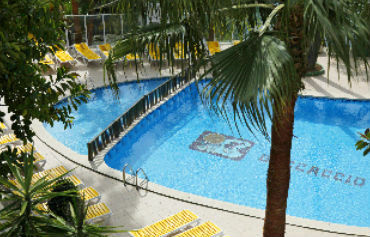 For family-friendly holidays in the Majorcan sun, you can't miss the Condes de Alcudia Hotel. Not only does this hotel sit close to the beach, but it boasts many difficult-to-match on-site facilities. The Hotel Piscis offers guests an All Inclusive board basis and is very popular with everyone who enjoys a lively, fun atmosphere at a great value price! Accommodation is in twin rooms with the capacity for up to 3 or 4 people. The 3 star Hotel More enjoys an enviable position, right next to More Vermell Beach, with stunning views across Puerto Pollensa Bay and Formentor. Nestling in pretty gardens and with a sea view pool at the front, this popular hotel is the perfect place for couples and friends seeking a relaxing and chilled out sunshine break. If you're looking for an action packed holiday right next to a stunning beach, consider the Iberostar Alcudia Park. Part of the popular Iberostar chain, this seafront Playa de Muro hotel pulls out all the stops to provide entertainment for everyone. Children have age appropriate kids clubs and grownups can choose from a plethora of activities in the sea and on dry land. 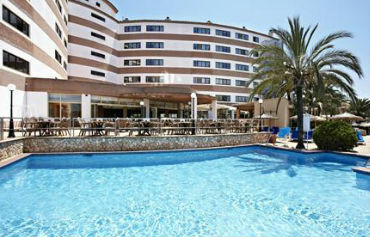 The 3 star Prinsotel Mal Pas offers everything you could possibly need for a relaxing holiday in Majorca. 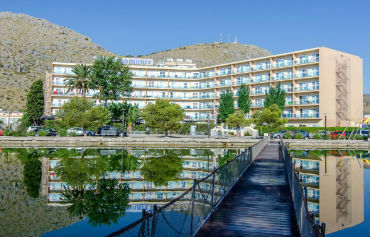 Situated in the Mal Pas area on the outskirts of Alcudia, this historic hotel is surrounded by trees, a swimming pool with integral childrens pool, sun terraces, a tennis court and snack bar. 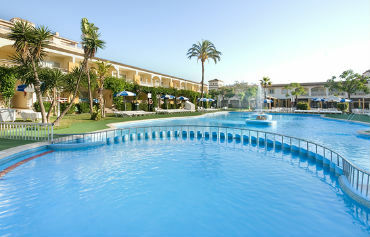 The Hotel Boccaccio sits in lush gardens close to Esperanza Lake in Alcudia. 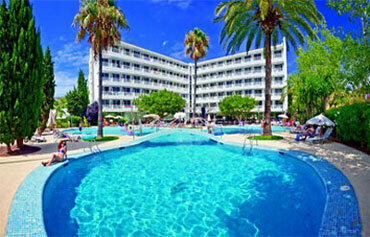 This Majorca hotel offers guests a wealth of facilities and stylish accommodation options. 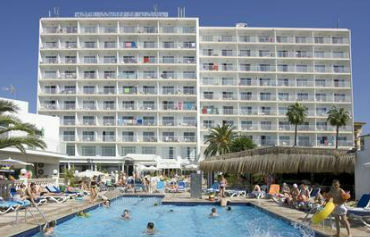 There is plenty to write home about when you stay at the JS Sol de Alcudia in Majorca. 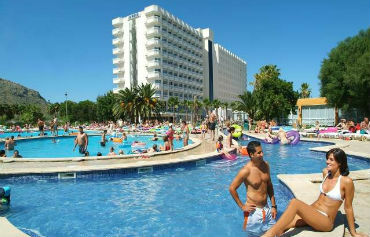 Firstly, there is the location, just a short walk from both Alcudia beach and Esparanza Lake. Secondly, there are the abundant onsite facilities to keep young and old happy. Club Mac is built around two natural lakes in the S'Albufera wetlands in Alcudia and consists of three buildings: the Jupiter, Marte and Saturno. The Grupotel Maritimo nestles in lush gardens in a quiet area of Alcudia. 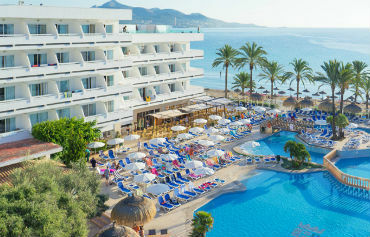 This Majorca hotel blends a welcoming atmosphere with a wealth of on-site facilities and stylish accommodation options. Even in tourist hotspot Alcudia, Condesa de la Bahia Hotel stands out. Overlooking the sea and surrounded by shady palm trees, this is a family-friendly place to make memorable holiday moments. For relaxing family holidays, Mariner Club Apartments is the perfect choice. This complex boasts a wealth of facilities for all ages, which complement the dining options and comfy guest rooms perfectly. 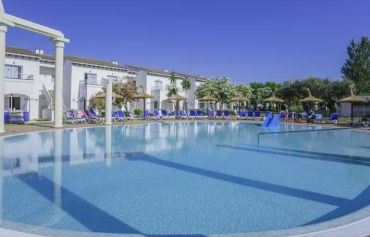 The stylish Sea Club Alcudia Hotel is set in lush gardens and combines family-friendly facilities with modern accommodation, excellent leisure pursuits, and tasty dining options. 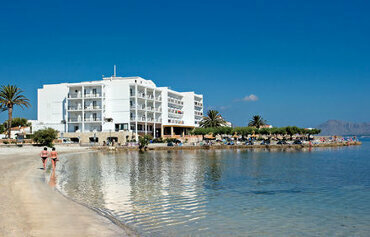 Bellevue Lagomonte boasts a picturesque lakeside setting on the outskirts of Alcudia. This all-inclusive hotel is the perfect spot to escape the trials of everyday life and enjoy round-the-clock-relaxation. Alcudia weather is a typically Mediterranean mix of low rainfall and long hours of summer sunshine. 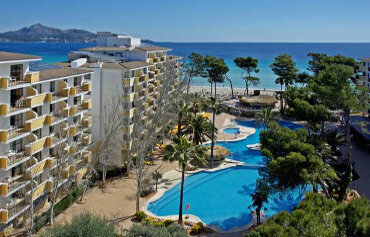 Majorca usually receives around 300 days of sunshine a year. Alcudia summer average temperatures usually hover around the mid 20ºs. Summer weather in Alcudia is exceptionally pleasant. There are lots of things to do on a holiday in Alcudia. The beach is lined with pedaloes and banana boats or you can try your hand at jetskiing, paragliding and kitesurfing. Gokarting at Karting Magic is a fun way to spend a couple of hours, as are the chutes and slides of Hidropark waterpark. Take a fishing or diving trip by boat from the harbour. Tennis courts and a golf course are on offer too. Keen hikers and birdspotters can explore the wildlife and scenery of the protected S'Albufera nature reserve. Alcudias nightlife is quite laidback but if youre looking for a lively time, head to the port area where youll find a few bars and discos. Entertainment is mainly hotelbased with live music and shows. There's no shortage of places to eat and drink in Alcudia. The choice includes Chinese, Indian, Italian and French meals together with British favourites and fast food options. For traditional Mallorquin fare and fine dining, head to the Old Town. For seafood and fish, Porte DAlcudia, at the end of the beach, is the place to be. Local wines go down well with your meal.